Sequim real estate maps and documents are hard to find online. The Internet addresses for these Sequim maps are impossible to remember, especially the long government websites that don’t have logical names. I’ve collected some of the most useful links to Sequim real estate maps so you can easily find all the information you need on particular properties. 1. Tax Assessor’s Site is packed full of useful information on their Sequim maps where you can look up any home or vacant real estate in the county by address, name, or tax parcel number. You may be interested in reading this article about How to Use the Tax Assessor’s Website. 2. The County Parcel Maps have a tremendous amount of information available at your fingertips. You can look at Sequim maps showing boundaries and dozens of selectable map features (roads, streams, lakes, tribes, DNR land, the Discovery Trail, city and county boundaries, etc.). By the way, the county programming on this Sequim real estate map will not load the map if your browser is sized too large. If it doesn’t load properly, reduce the size of your browser on your monitor. This is true for all the county online maps. 3. The County Boundary Maps are where you can see many more specific pieces of information about a property by selecting options in the right margin, like which irrigation district a parcel is in, school districts, hospital districts, precincts, fire districts, and so on. This looks very similar to the last map, but they are different. On the last map, for example, you won’t see irrigation districts. 4. The Parcel Status is where you can see the complete status of a property on all county issues. 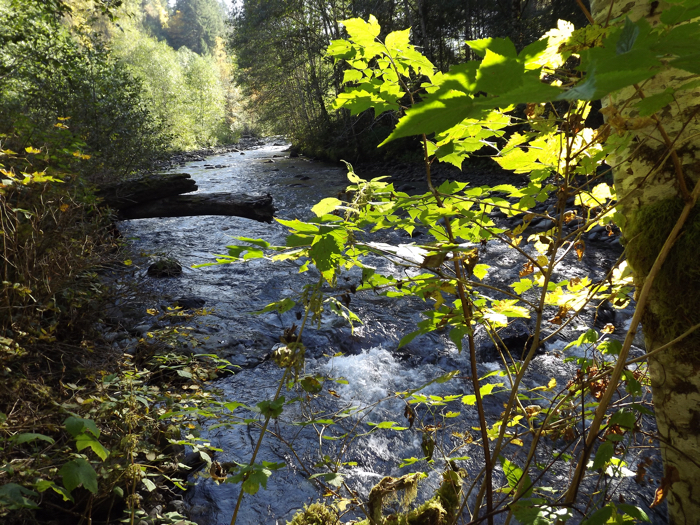 You can find out on this page if the land is included in the Dungeness Water Management area. You type in the tax parcel number and hit search, and up comes a screen with a link on the parcel number, and when you go to that link, you’ll get a page full of more information and links on documents effecting that parcel. Copy and paste this tax parcel number (033029550130) into the page below, and you’ll have an excellent example of the information you can see. All tax parcel numbers in this system must be typed with exactly 12 digits. If you have more zeros, delete them. 5. The County Auditor’s site includes all recorded real estate documents. This is where you can look at warranty deeds, deeds of trust, foreclosure notices (Notice of Trustee’s Sale), CC&Rs (Covenants, Conditions, and Restrictions), plats, and much more. These Sequim real estate maps are very useful when you’re thinking about buying a property. You need to know about the property restrictions and what you can and cannot do. 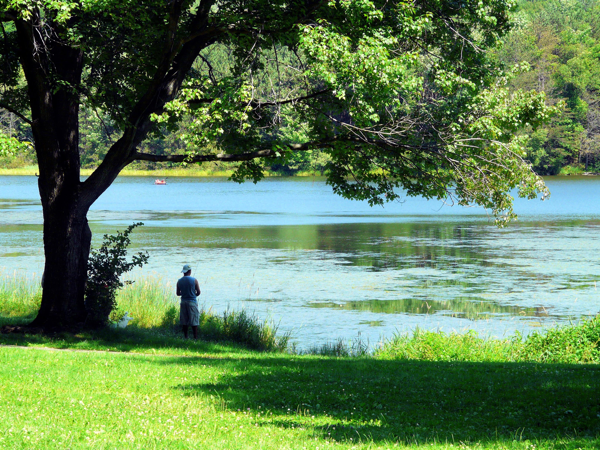 If your property will have a private well, you need to know if you’re in the water management rule that restricts residential use to 150 gallons per day for an entire family. If you will have a mini-farm or animals, you may want to be within one of our irrigation districts so you can have access to more water from April 15 to Sept 15. There’s no way to memorize these url’s. They’re too long and not intuitive, so be sure to book mark this page for future reference. Do you know how to intelligently search for a home? In other words, do you know how to effectively search without wasting time on poor websites or syndicated MLS sites with inaccurate information? Do you know how and where to search for answers to your questions an area or buying a home, and do you know the difference between credible information and unreliable information? Why is this important? When you’re retiring, the last thing you need is a nightmare that costs you money and creates tremendous stress for you! I don’t doubt your ability as a buyer to make wise decisions for yourself and your family, provided you have accurate information and you get good advice from your Realtor. But this is where many buyers fall down. They don’t know where and how to get good and accurate information and credible advice when buying a home. I strongly urge buyers to use a Sequim MLS site that includes all the local listings and that is 100% accurate because it pulls all its information from the source listings. The single most reliable real estate information on questions buyers ask all the time is found at the largest Sequim real estate blog. If you are on a mission to search for your retirement home, you definitely want accurate and reliable information about buying Sequim homes. You’ll find thousands of articles written for buyers at Sequim Real Estate Blog. These are carefully written by a Sequim real estate attorney (ret.) and broker who has lived in the area for 20 years. There are multiple links to other reliable and accurate sources in the right margin of that real estate blog. In addition to all these accurate resources, Chuck Marunde is available as your personal advisor, and that means you can be assured that you are getting honest and professional advice you need to avoid a nightmare scenario. It also means you will be equipped to make wise decisions as you search for a home. Home sellers who want to sell their homes have major decisions to make. The challenge for the vast majority of home sellers is that they have not had a career in real estate, and there is much they do not know about how the real estate industry really works, the differences between listing agents and selling agents, and they don’t know the gimmicks that listing agents use to get listings. Having been a real estate attorney and now a real estate broker, I have a passion to protect consumers and give them the absolute truth. This book will show sellers what they need to do to get their homes sold, and what they should avoid. Most home sellers do not know the dramatic differences between a listing agent and a selling agent. Some think they are the same person, but they are not. 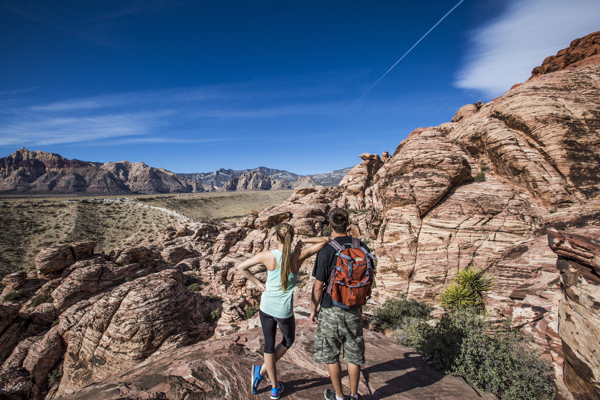 Today listing agents, as they have for several decades, focus on getting listings. The more listings they have, the more money they can make, because other “selling agents” will sell their listings for them. Selling agents are the agents who market directly to buyers, and it is selling agents, not listing agents, who have large marketing systems. Home sellers typically expect listing agents to have large marketing systems, but it just isn’t true most of the time. This book challenges traditional thinking, and as a result many home sellers are deciding to list their home with a selling agent who actually does everything a listing agent does but a whole lot more when it comes to marketing. If you are going to list a home for sale anywhere in the United States, I strongly recommend you read this book first. It will save you from making some potentially big mistakes, which could mean tens of thousands of dollars for you, not to mention delays for months and all the stress. 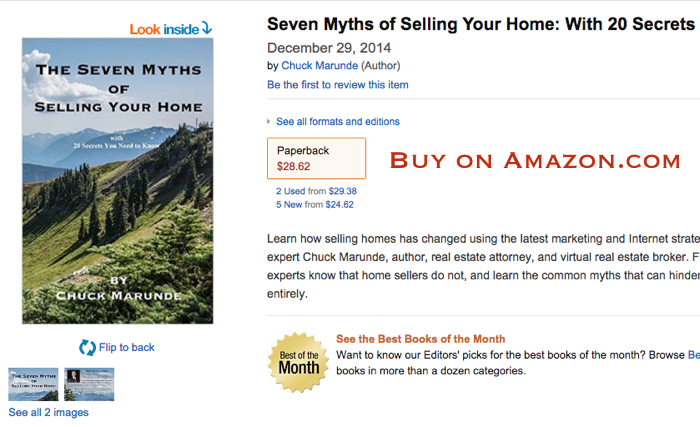 You can learn more about how to list a home by going to Amazon at 7 Myths of Selling Your Home. Did you know there is a Sequim Video Youtube site all about buying real estate? There are Sequim videos on the real estate market, videos on the area, and instructional videos about how to find and use some powerful Sequim resources online. Just go directly to Sequim Videos, and you’ll see a home page with some videos, but you can also go to “Playlists” which you will see near the top under the banner, and there’s a link to all the videos, too. 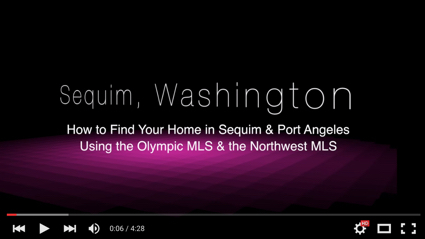 If you’re in the market for a home in Sequim or Port Angeles or Port Townsend, you will find many videos on how to find and use the best MLS site for the area and how to get the most out of that MLS site. 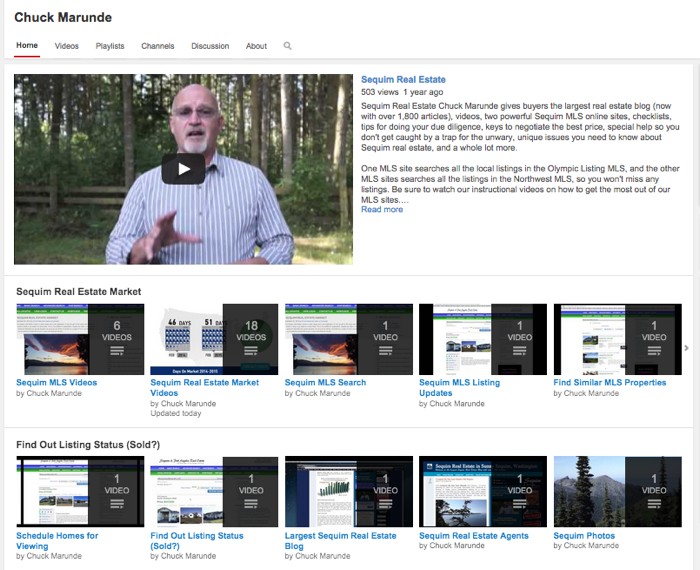 Sequim videos are just another service offered to buyers courtesy of iRealty Virtual Brokers and Chuck Marunde.